The "Clock Man" character from the short. 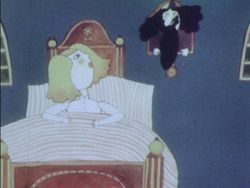 O páradivé Sally (About Dressy Sally) is a short animated film that was produced in Communist Czechoslovakia in 1976. An English dub was made in the U.S. two years later. It allegedly aired on Pinwheel (the channel that turned into Nickelodeon) in the 1980s, under the name Sally. The animation was photographed by Jasoň Šilhan and directed by female director Dagmar Doubkova. It was exported around the world, yet none of the creators knew exactly where their films would end up, due to Czechoslovakia being a Communist nation at the time. The film received an honorable mention at the Gottwaldov Film Festival in 1977. 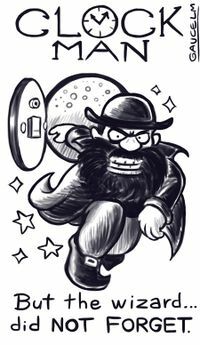 Artist's impression of "The Clock Man." Art by Gaucelm/Reynard. According to Commander Santa, the short involved a young boy laying in his bed, who gets snatched up by the "Clockman," a discolored, unkempt entity that emerges from the wall clock above the child's bed at the stroke of midnight. The boy, after being taken on an eerie adventure, is subsequently returned to his room before sunrise. Still renditions by Commander Santa. Sally sees the wizard "Mr. Kadabra" emerge from her wall clock. This specific moment - that imprinted itself in the memory of forum user "Commander Santa" who would bring it back to the spotlight - has led to the elusive short being nicknamed "Clock Man." While the two descriptions provided differed in many ways, they were, in fact, referring to the same piece of animation, as it turns out the smaller details were misremembered. This is a chronological list of leads and theorized origins that were followed up on heavily over the span of the search. In 2016, Dycaite contacted Michael Karp, a writer on Pinwheel, who gave him the contact information to Tippi Fortune, the Executive Producer for the show in the early 80s. When Tippi responded, she said that most of the films featured on Pinwheel were acquired from Coe Films. After some research, It was discovered the founder and head of Coe Films, Bernice Coe, had passed away in 2001. Looking for Coe Film catalogs and contacting old employees became the biggest lead in the search, as it was one of the two major ways to locate "Clock Man." Comparison between the 7 O' Clock Man and "Clock Man." Originally posted by RSTVideo on the Lost Media Wiki Discord server. With this proposal, many things began to make sense. Both 7 O' Clock Man and "Clockman" have a very similar appearance and name. Both of them had the beard and wore a trench-coat. Furthermore, folkloric description of what the 7 O' Clock Man did seem to be similar to the plot of "Clock Man." On December 10, 2017, Lost Media Wiki forums user NitrateNerd discovered a YouTube link to the infamous film after searching for the short on WorldCat (a worldwide library catalog), while looking for a synopsis for an educational film titled "The Wizard", as a possible lead. Instead, after several pages of results, a listing for "Sally" showed up, with a synopsis seeming to match Clock Man. After a quick google search, he found it was uploaded by the current owners, AAA studios on YouTube. Eleven days after its discovery, Commander Santa confirmed it was the same short he'd seen many years ago. This Archive that contains both versions of "Clock Man" have additional English translated subtitles available to download from the main site. Both versions of "Clock Man" on Archive.org (w/ subtitles). O parádivé Sally (original Czech version of "Clock Man"). The dub is currently available for viewing on Vimeo, Uloz.to, Dailymotion and VK in SD. The Full HD version of the English dub can be downloaded through Mega or viewed on Google Drive. AAA Studios has also uploaded the English dub to their YouTube account, remixing the English dub audio with color-corrected footage from the original Czech version. Sally (16mm transfer of English dub, courtesy of TOMYSSHADOW and Skip Elsheimer from A/V Geeks). Sally (English audio synced up with video of the Czech version). Another change was The Wizard's name. 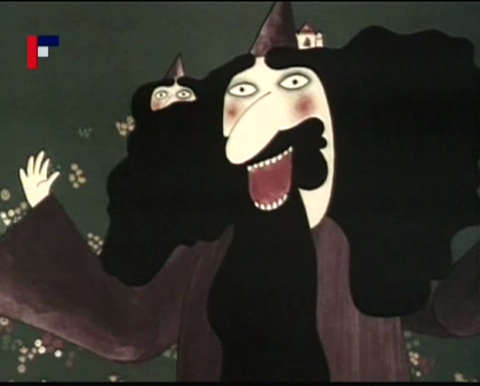 In the Czech dub, he is only referred to as a "small, black sorcerer." In the English dub, he has the name "Mr. Kadabra."